Kansas City artist Robert Quackenbush chisels multi-faceted stories of the earth and humanity in his “Fragments” show of recent paintings and mixed-media collages at the Leedy-Voulkos Art Center. Layered in a rich stratum of materials and ideas, the exhibit is a compelling voyage through thought-provoking, enigmatic juxtapositions. Of the 19 works in the exhibit, four are large-scale, mixed-media panels from the artist’s most recent series, “Unearthed Fragments.” Evoking a variety of ancient art forms, these works echo the powerful life-force that emanates from Native American cave paintings. Like a shaman, Quackenbush crosses those permeable boundaries where the spirit and natural worlds intersect and become one. Through a vigorous sanding and grinding process, he elicits the power in the materials themselves to illuminate some of those concealed mysteries. Though Quackenbush unfolds fragments of the mysteries, secrets remain for viewers to uncover and discover for themselves. “I arrive at my own final solution — and then ask the viewers to make their own final solution,” Quackenbush says. He draws us in through the duality, or even pluralism, of these multi-layered visual messages. In the top plane of “Unearthed Fragments #4,” poetic leaf forms float freely in a lyrical, peaceful space. In the lower plane, a fiery, red-orange coil burns with power and joy, conjuring a dazzling raku pot hot out of the fire. 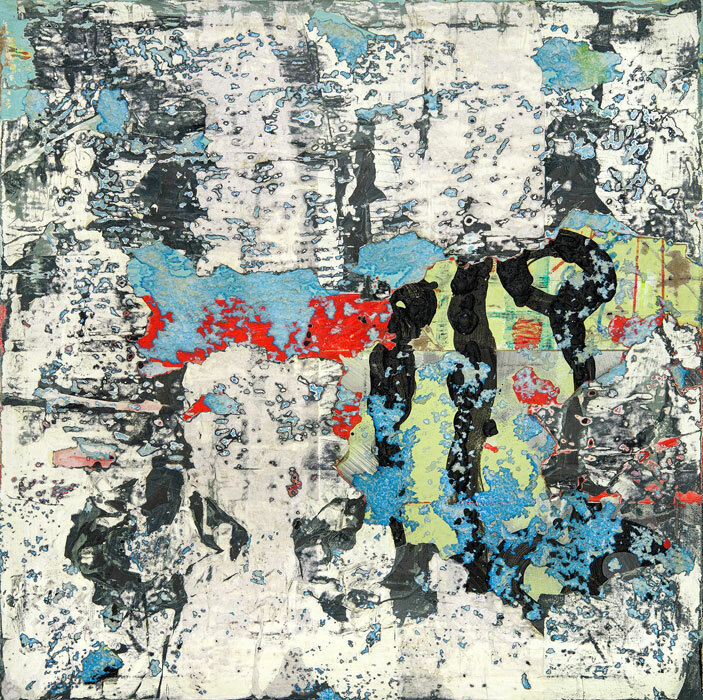 Not only is there juxtaposition within the “Unearthed Fragments” series, contrast also occurs between these works and the 15 other pieces in the show, which include a diverse spectrum of mixed-media collages on panels and paper. Whereas the “Unearthed Fragments” series evokes ancient history and binds us closer to our earthly roots, the collages, created from “fragments” of materials, speak more poignantly to our contemporary world and the culture in which we daily navigate. The abstract mystery and unspoken language of “Unearthed Fragments” contrasts with the tangible, tactile metaphors and intense realism in the frequently allegorical collages. Quackenbush explores the drama of human existence, where spirit and earth continually converge and diverge. Life and death share a canvas where hope challenges danger and devastation, and joy and suffering coexist — yet don’t. Here, Quackenbush draws from a deep well of symbolism and iconography, often related to his Catholic faith. 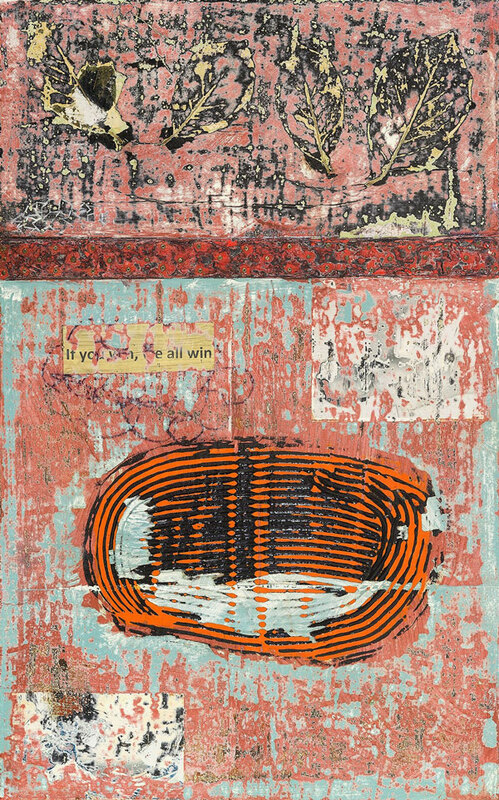 He has strategically, thoughtfully, placed image transfers and photographs amid small paintings, drawings, geometric shapes, and a myriad of other materials to tell stories that shift and fluctuate through time, space and interpretation. Though the symbols and figures are accessible and often familiar, discovering the connection between the elements is a journey that viewers will travel and interpret for themselves. 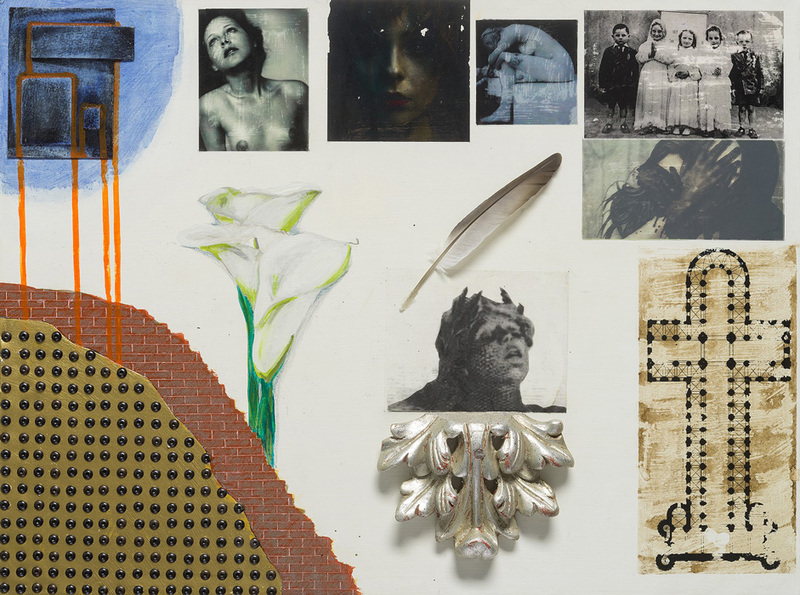 Though Quackenbush frequently employs centuries-old iconography and symbolism, such as Gothic cathedral blueprints, Madonna imagery, Greek sculpture, and European female royalty, these collages feel grounded in present-day life — in particular, the experience of women. In the 2017 work, “For Mothers Who Mourn Their Lost Children,” he uses both representational and abstract imagery to convey the spectrum of women’s suffering when facing the loss of their children, regardless of the reason. 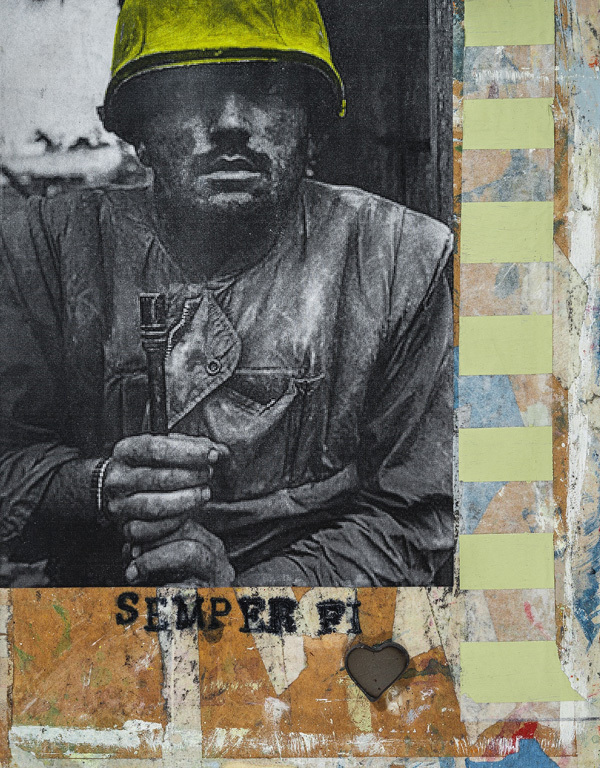 Sadness, remorse, and guilt represent only a few of the wrenching emotions in this collage. The work also exemplifies the strategy of juxtaposition woven through the show. “I have a strong feminine side. People do not know I am religious and the femininity of the Messiah has been an integral part of everything I’ve done,” Quackenbush said. “I have a deep respect and concern for what women go through and have gone through. I look for ways to portray the difficulties women have.